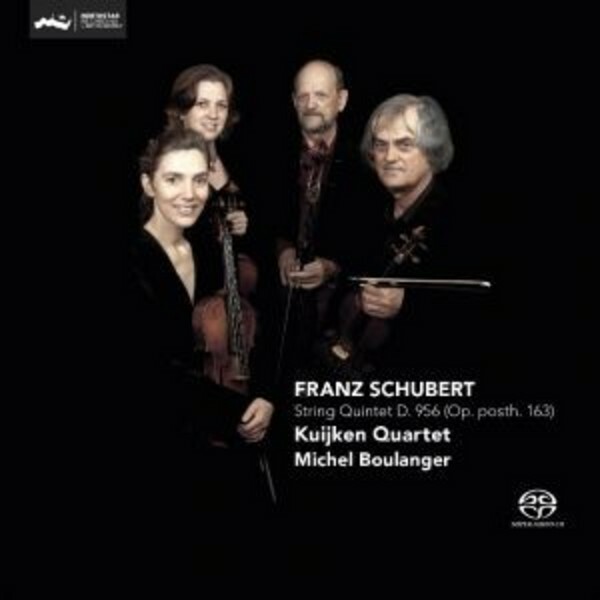 On this hybrid SACD, the renowned family group the Kuijken Quartet, alongside cellist Michel Boulanger, performs one of the acknowledged masterpieces of the chamber music repertoire - Franz Schubert�s String Quintet in C major D956. During his lifetime, Schubert was primarily known for being a composer of lieder. Indeed, much of his chamber music and several symphonies remained unknown when he was alive and were only published and performed later by others, including Schumann and Brahms. One such piece, which is today considered to be amongst the composer�s greatest works, is the String Quintet in C major of 1828. It is a quirk of fate that this exceptional composition, written just a few months before the composer�s death, was unknown for an entire generation. First performed in 1850, it was only published three years later. Like Luigi Boccherini�s quintets, Schubert�s is written for two violins, one viola and two cellos, as against the customary two violas and one cello. This arrangement gives the work added emotional depth and a poignancy that is particular to this great composer�s music. The Kuijken Quartet is made up of two generations of musicians from the Kuijken family (Veronica, Sigiswald, Sara and Wieland Kuijken). They are joined on this recording by Michel Boulanger as the first cello. Whilst the Kuijken family name is generally linked with period performance practice, they are playing here on so-called modern instruments. The group has, however, attempted to re-capture the style and spirit of Schubert�s time.